The city of Riddleport is no place for the naive. Founded by pirates and ruled by criminals, Varisia's most lawless city chews up the weak and foolhardy. In other words, it's a perfect home for adventurers! Take the first step into Riddleport, the starting city for Pathfinder's Second Darkness Adventure Path. The information contained herein gives players the edge they need to face this deadly quest, with new rules, details on making campaign-specific characters, and background information no adventurer should be without. Even if you aren't playing the Second Darkness Adventure Path, this booklet is filled with all new spells, magic items, and character options perfect for any game. 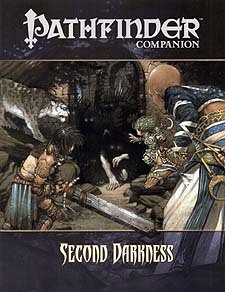 * Details and roles for every character race and class, specifically tied to Pathfinder's Second Darkness Adventure Path but usable in any campaign! * Riddleport's gazetteer, including everything you need to know about its government, prominent locations, important characters, Riddleport slang, and more! * Character Traits and special features that instantly tie characters into the campaign and grant benefits to aid in adventures to come! * New spells, new magic items, new feats, and a new prestige class! * Full-colour maps of Varisia and Riddleport, the City of Cyphers!